Australia’s dialogue partner relationship with ASEAN is more suitable for Australian interests in Southeast Asia than the idea of ASEAN membership. Australian membership in ASEAN is currently not possible. Australia’s dialogue partner relationship with ASEAN supports Australian policy autonomy and Australia’s engagement with Southeast Asia. The ASEAN–Australia dialogue partner relationship has significant room for growth. The first ASEAN–Australia Special Summit held in Sydney in March 2018 led some Australian commentators to advocate for Australia to join the Association of Southeast Asian Nations (ASEAN). Even if Australian membership could be made possible by changing the ASEAN Charter and achieving a consensus among ASEAN member states in favour of membership, it would not serve Australian interests in Southeast Asia as well as Australia’s current dialogue partner relationship with ASEAN. Proponents of ASEAN membership overstate the importance of ASEAN to Australia, understate the benefits of the current dialogue partner relationship, which has room for enhancement, and do not fully address the likely policy constraints and financial costs of ASEAN membership. When it comes to ASEAN, Australia’s status quo dialogue partner relationship is more suitable than quixotic appeals for membership in ASEAN. March 2018 marked a significant symbolic milestone for Australia–ASEAN relations. For the first time in its 44-year relationship with ASEAN, Australia hosted an ASEAN summit. Nine of the ten leaders of ASEAN member states attended the ASEAN–Australia Special Summit. President Rodrigo Duterte of the Philippines sent his foreign minister. This historic special summit came four years after the first Australia–ASEAN Commemorative Summit in Myanmar in 2014, celebrating 40 years of dialogue partner relations. It was also 14 years since the sole ASEAN–Australia–New Zealand Commemorative Summit in Laos in 2004 to celebrate the 30th anniversary of dialogue partner relations. For Southeast Asian states, commemorative or special summits hosted by ASEAN dialogue partners are becoming the norm rather than the exception. Japan and India have each hosted two commemorative summits with ASEAN. Over the past six years alone, leaders of ASEAN member states have attended summits held by six of the ten ASEAN dialogue partners. Among dialogue partners, only New Zealand, Canada, and the European Union have yet to host a summit with ASEAN. We acknowledge that the ASEAN–Australia Special Summit marks a new era in the increasingly close ASEAN–Australia relationship, elevated to a Strategic Partnership in 2014. This Summit reaffirms that we are partners with a vital stake in a dynamic region undergoing major changes. We commit to intensify our shared work to shape a secure and prosperous region for our people. A number of Australian journalists went so far as to propose that Australia join ASEAN. The idea of ASEAN membership was not new. Former Prime Minister Paul Keating proposed Australian ASEAN membership in 2012. Richard Woolcott, Secretary of Foreign Affairs and Trade from 1988 to 1992 and later Prime Minister Rudd’s envoy for his stillborn Asia-Pacific Community proposal, noted in his memoirs that he had first contemplated the benefits to Australia of membership in ASEAN in the 1970s. Peter Hartcher, political editor and international editor of The Sydney Morning Herald, asserted that Australian membership in ASEAN was a “great idea”, claiming that “Australian leaders as far back as John Gorton and as recently as Malcolm Turnbull have fantasised about this idea in private”. These calls for Australian membership in ASEAN, or for a yet to be created category beyond its current dialogue partner status, are more advocacy than analysis. Proposals for Australian membership in ASEAN around the special summit were not reciprocated in Southeast Asia, and it is unlikely that any Southeast Asian leader fantasised about it either. Even if ASEAN, a consensus body of Southeast Asian states, did alter the ASEAN Charter and extend an invitation for Australia to join, Australian membership in ASEAN, or a new “community partnership” with ASEAN, would not be a good idea. Australia is only in the middle of the pack when it comes to the depth and scope of dialogue partner relations with ASEAN (see Annex 1 one for more detail). Canberra’s current dialogue partner relations with ASEAN — more extensive than New Zealand, the United States and Russia, and less extensive than South Korea, Japan and China — are the most suitable arrangement for Australia and will remain so for the foreseeable future. More importantly, proposals for membership of ASEAN overstate the importance of ASEAN to Australia, ignore or understate the benefits of the current dialogue partner relations, and dismiss the greater costs of membership or a much closer relationship. One of the highest costs of membership in ASEAN would be Australia’s policy autonomy. This is particularly important for Australia’s policy stance on sensitive issues such as human rights violations in the region or China’s actions in the South China Sea. Policy autonomy for ASEAN members is constrained because ASEAN joint statements are reached by a process of consensus. They are often silent on issues of concern to Australia including the plight of Myanmar’s Rohingya population and the unanimous, precedent-setting July 2016 arbitral tribunal ruling on Philippines v China concerning the South China Sea disputes. ASEAN’s foundational consensus principle provides each member state in practice a veto over the language used in ASEAN statements on issues of particular ‘sensitivity’ for them, which all ASEAN member states are under institutional pressure to respect. For example, at the insistence of Myanmar the term ‘Rohingya’ is not used in ASEAN documents. subordinate aspects of Australian foreign policy to ASEAN. It would require Australia to refrain from any real criticism of ASEAN governments (e.g. on human-rights issues) and from putting forward alternatives to ASEAN positions. It would require Australia to accept other ASEAN countries, notably the ASEAN Chair, representing Australia in discussions with external parties such as the United States, China and international organisations. As a dialogue partner, Australia labours under no such constraints. Dialogue partner status allows Canberra to choose which policy areas to engage with through ASEAN and to avoid signing up to ASEAN joint statements. Membership would not allow such flexibility. Australia is overwhelmingly dependent on ASEAN working and working well … the organisation still happens to be terribly important to Australia’s security, stability, and prosperity. Not only is ASEAN Australia’s third-largest trading partner, but much of the rest of our trade passes through ASEAN waters to our top two trading partners. The Commonwealth Government claims that more than 1.3 million ASEAN visitors came to Australia in 2016–17. Shadow Foreign Minister Penny Wong, when calling for closer relations with ASEAN on the Lowy Institute’s Interpreter magazine in 2017, stated that ASEAN has the world’s third-largest labour force. The Turnbull government and Shadow Foreign Minister are far from alone in giving ASEAN more credit than the regional organisation is due. Increasingly the media, government organisations, and even academic publications refer to ASEAN states, ASEAN citizens, ASEAN waters, ASEAN exports, the ASEAN region, and ASEAN as a middle power. Linguistically at least, Southeast Asia, one of the most diverse regions in the world, is at risk of being subsumed by ASEAN. Yet, these proclaimed ASEAN entities are not derived from or beholden to ASEAN at all. ASEAN has no citizens, labour force, or visitors to Australia, controls no waters, and neither exports or imports goods and services. ASEAN is not a region; Southeast Asia is. ASEAN, as its name says, is an association of Southeast Asian states. Southeast Asian states have not surrendered their sovereign powers to the ASEAN Secretariat. Southeast Asian states have never triggered the dispute settlement mechanism in the ASEAN Free Trade Area trade bloc agreement, preferring to use the World Trade Organization dispute settlement mechanism instead. This shorthand conflation of ASEAN with the Southeast Asian region and Southeast Asian sovereign states reifies ASEAN. It falsely awards the Association, with its small, stretched Secretariat that has a budget equivalent to that of a large university department, too much credit. It places too many inflated expectations on the Association for the economic development and peace and security of Southeast Asia and for Australia’s relations with the states of Southeast Asia. Australia’s strategic outlook would certainly be more worrying if claims by Australian commentators that ASEAN is “terribly important” to Australian stability and that “Australia’s interests would be deeply compromised if ASEAN stalls” are accurate. They are not. Independently of ASEAN, Australia’s bilateral relations with all Southeast Asian states are more important for pursuing Australia’s interests with these states. This is particularly the case with some of Australia’s closer and more important relations with Southeast Asian states such as Indonesia, Singapore, and Malaysia. Australia’s current official development assistance allocation provides one measure and reaffirmation of this disparity. In 2018–19, the seven Southeast Asian states that receive official development assistance from Australia will each receive significantly more aid than the Australian aid allocated to ASEAN and Mekong projects. This latter category accounts for 3.3 per cent of total planned Australian official development assistance to Southeast Asia. Indonesia, by itself, will receive 31.6 per cent, while Timor Leste, not an ASEAN member state, attracts 9.2 per cent. While ASEAN is the most important regional body facilitating Australia’s relations with Southeast Asian states, and it is beneficial to Australia’s relations with some ASEAN dialogue partners, it is not the only channel. Australia has long cooperated with Southeast Asian states through APEC and the Five Power Defence Arrangements and more recently the Regional Cooperation Agreement on Combating Piracy and Armed Robbery against Ships in Asia (ReCAAP) and the Asian Football Confederation, for example. The United Nations, World Trade Organization, and World Bank, among others, serve the same purpose at the global level. A brief look at Australia’s trading relations with Southeast Asian economies provides more evidence of the need to distinguish ASEAN from Southeast Asia. When it comes to Australian trade with Southeast Asia, the ASEAN–Australia–New Zealand Free Trade Agreement (AANZFTA) signed in 2009, is the deepest and broadest of the five free trade agreements between dialogue partners and ASEAN. Yet it has had less of an impact than one might expect on trade and investment flows between Australia and Southeast Asia. Since ASEAN is a not a customs union, Southeast Asian states are free to pursue bilateral and plurilateral trade agreements outside of ASEAN. Singapore (in 2002), Thailand (2003) and Malaysia (2012) signed bilateral agreements with Australia. When services are included, Singapore is Australia’s largest trading partner and largest host country for Australian foreign direct investment in Southeast Asia. Thailand is Australia’s second-largest trading partner in the region and Malaysia the third largest by some margin. Australia’s bilateral deals with Singapore, Thailand, and Malaysia are deeper and more utilised for the relevant two-way trade than AANZFTA. For one example among many, in 2011 only 26.5 per cent of Thai firms used AANZFTA in their trade with Australia, falling to a paltry 2.8 per cent in 2012. The respective utilisation rates for the bilateral Thailand–Australia Free Trade Agreement were much more robust at 90.8 per cent and 60.7 per cent, respectively. These huge differences strongly suggest that the bilateral trade agreement between Australia and Thailand is deeper, broader, easier to use, and better known in 2011 and 2012 than AANZFTA. These bilateral trade agreements involving Australia and Southeast Asian states likely have had a greater positive impact on Australian trade with Southeast Asia than AANZFTA. This discrepancy is partially due to the fact that Australian trade with Southeast Asia, both for exports and imports, is heavily concentrated in key Southeast Asian markets. In 2017, the top four Southeast Asian markets (Singapore, Indonesia, Malaysia, and Vietnam) accounted for 77.2 per cent of total Australian visible goods exports to Southeast Asia, while the four smallest (Laos, Cambodia, Brunei and Myanmar) accounted for 0.9 per cent (Table 1). The story was very similar in 2013. Imports are even more heavily concentrated. In 2017, the four major Southeast Asian sources of visible goods imports to Australia (Thailand, Malaysia, Singapore, and Vietnam) accounted for 87.8 per cent of total visible goods imports from Southeast Asia, while the four smallest sources (Laos, Myanmar, Cambodia, and Brunei) only accounted for 1.1 per cent (Table 2). Again, 2013 told a similar story. Looking to the future, AANZFTA’s undoubtedly positive impact on Australia’s trade relations with Southeast Asian economies may be further reduced. Australia and Indonesia (Australia’s fourth-largest trading partner in Southeast Asia) have been negotiating a bilateral comprehensive economic partnership agreement since 2010 with Indonesian President Joko Widodo claiming in March 2018 that “it is only technical things [holding up the deal], between the minister and the minister”, adding there was “no problem” to the issues being resolved. According to Tom Lebong, Chairman of the Investment Coordinating Board of Indonesia, the Indonesian president would like the agreement to be signed by August 2018. Beyond bilateral trade agreements with key Southeast Asian trading partners, Australia’s signature on the Comprehensive and Progressive Trans-Pacific Partnership (CPTPP) mega-regional trade deal that awaits ratification holds more promise for Australian trade relations with Southeast Asia than Australia’s participation in the ongoing ASEAN-led Regional Comprehensive Economic Partnership (RCEP) negotiations. The CPTPP includes Malaysia, Singapore, Vietnam, and Brunei, while the sitting governments in Thailand, Indonesia, and the Philippines have all expressed interest in joining the CPTPP if and when it becomes open to new members. The RCEP negotiations include all ten ASEAN member states but five years into the negotiations only two of the sixteen chapters have been completed. Any eventual RCEP deal will likely be less liberalising than the CPTPP agreement and possibly than AANZFTA itself. ASEAN and AANZFTA have had a limited direct impact on Australia’s trade relations with Southeast Asian economies. As such, they are hardly “terribly important” to Australian trade relations with Southeast Asia, and it is difficult to see that these relations would be “deeply compromised” if ASEAN-based trade efforts “stall or fail”. The proponents for Australian membership in ASEAN understate the significance of Australia’s dialogue partner relations with ASEAN. This current relationship, approaching its golden anniversary in 2024, is truly a ‘win-win situation’ for Australia and ASEAN. Canberra has no similar type of relationship with any other regional organisation representing a region that does not include Australia. Since 2013, Australia has had a dedicated ambassador and mission to ASEAN. Its closest counterpart in Australia’s stretched international diplomatic network is the Australian Embassy in Belgium, which covers Australia’s relations with Luxembourg, NATO and the European Union, and houses Australia’s defence attaché to NATO. A concrete expression of Australia’s support for ASEAN’s integration efforts. ASEAN’s greatest success has been to establish and improve relations among Southeast Asian states, rather than between Southeast Asian states and others outside the region. ASEAN has helped transform Southeast Asia from a regional security complex of distrustful neighbours seeing each other as major threats, to a security community where war between regional states is increasingly unlikely. The expansion of ASEAN membership in the post-Cold War era to include Vietnam, a former Cold War foe, is the best example of this success. A Southeast Asian region that is more of a security community than a security complex, and an open trading bloc where regional economies are integrating is undoubtedly a positive development for Australia. The development of a wide range of ASEAN–Australia mechanisms for cooperation. The normal ASEAN–Australia summits, which from 2016 became biennial events, provide an opportunity for Australian leaders to meet with their Southeast Asian counterparts with no other dialogue partners in the room. The large and expanding number of ASEAN–Australia mechanisms at the senior official level deepens Australia’s relations with Southeast Asian states at the working level as well. The list of initiatives agreed upon at the ASEAN–Australia Special Summit is a good example of the breadth of the ASEAN–Australia dialogue partner relationship. The final clause of the Sydney Declaration welcomes “initiatives arising from this Summit covering the areas of counter-terrorism; counter trafficking in persons; cyber security and digital trade; defence; maritime; economic; urbanisation and infrastructure; connectivity; education; health; and women, peace and security”. These regular ASEAN–Australia interactions help build greater familiarity, understanding and, potentially, trust. This is particularly the case for states such as Laos and Cambodia that have comparatively weaker historical ties with Australia and do not participate in other forums that include Australia such as APEC, the Organisation for Economic Co-operation and Development (OECD), and the Five Power Defence Arrangements. Participation in the wide array of ASEAN-led bodies (see Annex 1 for more detail) that permit Australian officials, ministers and prime ministers to engage with their Southeast Asian counterparts and other dialogue partners across a range of important policy areas. Of particular importance for Australia is the East Asia Summit referred to in the Sydney Declaration as “the region’s premier Leaders-led strategic forum”. APEC, by comparison, does not cover the same array of policy areas and is particularly weak in security policy areas. These ASEAN-led bodies are the main formal institutional components of East Asia’s regional diplomatic architecture, most of which include Australia. ASEAN and Australia released Joint Declarations for Cooperation to Combat International Terrorism in 2004 and 2016. ASEAN and Australia work closely together on transnational crime, with annual consultations at the senior officials level and a two-year work program on counterterrorism and transnational crime from 2015. Australia participates in work programs with ASEAN in immigration and consular affairs at the Directors-General and Heads of Division levels. At the inaugural ASEAN–Australia Customs Consultation in 2017, the Australian delegation was led by the Commissioner of the Australian Border Force. At least half of the policy areas with new initiatives in the Sydney Declaration concern security cooperation and regional security was the first functional area covered in the Declaration. ASEAN member states and Australia signed a Memorandum of Understanding on Cooperation to Counter International Terrorism in 2018, outlining a number of cooperation dialogues and workshops. The Australian Government has contributed $83 million since 2003 to ASEAN efforts to combat human trafficking and announced a further $80 million package over the next ten years. Australia has co-chaired or co-hosted with ASEAN member states a large number of naval exercises, seminars, workshops, and working groups, and issued joint statements addressing counterterrorism, violent extremism, transnational crime, and maritime security cooperation through its participation in various ASEAN forums. A final, if subordinate, benefit of dialogue partner relations is that Australia does not have to bear the costs of organising many ASEAN-led meetings or attend all of the ASEAN meetings held every year, which in some years have exceeded one thousand. Given the problems the Department of Foreign Affairs and Trade currently faces in the inter-departmental struggle for funds, the hefty bill attached to ASEAN membership would be hard to justify. The Sydney Declaration stated that ASEAN–Australia relations are in a new era of greater shared interests and cooperation. However, it is hardly the first new era of deeper relations between ASEAN and Australia that can be proclaimed during the 44 years of ASEAN–Australia dialogue partner relations. Australia’s cooperation with ASEAN in relation to Cambodia in the 1990s, the establishment of the ASEAN Regional Forum in 1993 with Australian support, Australia becoming a founding participant in the East Asia Summit in 2005, and the signing of AANZFTA in 2009 each represented a new enhanced level of ASEAN–Australia cooperation. It is not clear what is so different today that makes Australian membership in ASEAN (even if it were possible) more suitable for Australia than the dialogue partner status quo. 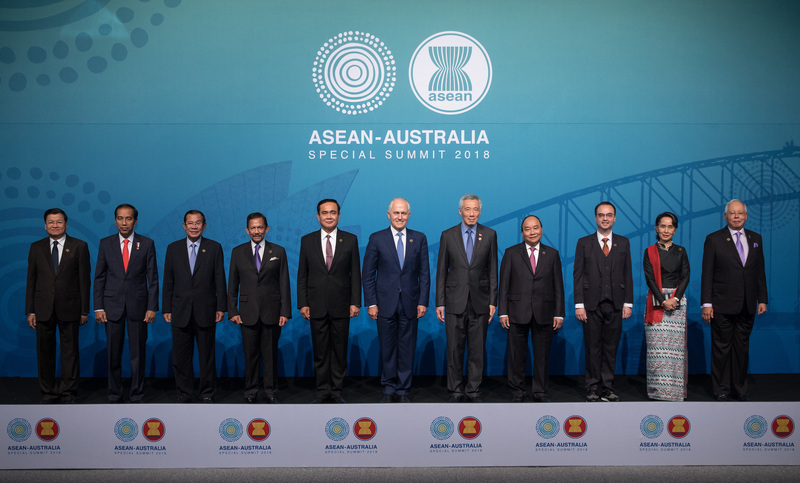 As shown by the ASEAN–Australia Special Summit and its lengthy joint statement, Southeast Asian states welcome more Australian dialogue partner support for more ASEAN initiatives. Australia could seek to join the ranks of Japan, China, Korea, the United States, and India and hold annual normal ASEAN–Australia summits rather than the current biennial ones. Befitting their size, China and Japan have broader and deeper dialogue relationships with ASEAN with more mechanisms for cooperation across more functional areas than the current ASEAN–Australia dialogue partner relations. If future Australian governments do believe deeper relations with ASEAN are in the national interest, there is sufficient scope to achieve this within the current dialogue partner relationship. Australia’s current dialogue partner status with ASEAN is the most suitable status quo. * ASEAN and Japan established informal dialogue relations in 1973. They formalised relations in March 1977 with the convening of the ASEAN–Japan Forum: see “Overview: ASEAN-JAPAN Comprehensive Economic Cooperation”, http://www.aseansme.org/zfta_ajcep. I would like to thank the three reviewers and Michael Fullilove, Alex Oliver and Lydia Papandrea at the Lowy Institute for helping to make this a much better paper. ASEAN distinguishes between three types of summits with dialogue partners, all of which are at the leaders’ level. Normal summits are held at the same time as the second ASEAN Summit and related meetings of the year and includes dialogue partners, unlike the first ASEAN Summit of the year which does not. Five of the ten ASEAN dialogue partners hold annual normal summits with ASEAN; Australia, however, does not. Commemorative Summits celebrate an anniversary of the dialogue partner relationship and can be held in the ASEAN host country or in the dialogue partner’s country. Special Summits are held in a dialogue partner’s country and are not linked to an anniversary of the dialogue partner relationship. ASEAN’s ten dialogue partners are Australia, Canada, China, the European Union, India, Japan, New Zealand, Russia, South Korea, and the United States. “Joint Statement of the ASEAN–Australia Special Summit: The Sydney Declaration”, ASEAN–Australia Special Summit, Sydney, 18 March 2018, clause 2, https://aseanaustralia.pmc.gov.au/Declaration. Graeme Dobell, “Australia as an ASEAN Community Partner”, Australian Strategic Policy Institute Special Report, February 2018, https://www.aspi.org.au/report/australia-asean-community-partner; Peter Hartcher, “Why Australia Joining ASEAN Is a Great Idea”, The Sydney Morning Herald, 15 March 2018, https://www.smh.com.au/politics/federal/why-australia-joining-asean-is-a-great-idea-20180315-p4z4kk.html. Paul Keating, “Asia in the New Order: Australia’s Diminishing Sphere of Influence”, Keith Murdoch Oration, State Library of Victoria, 14 November 2012, http://www.keating.org.au/shop/item/keith-murdoch-oration-state-library-of-victoria. Cited in Graeme Dobell, “Suharto’s ASEAN versus the ASEAN Community”, The Strategist, 26 March 2018, https://www.aspistrategist.org.au/suhartos-asean-versus-asean-community/. Hartcher, “Why Australia Joining ASEAN Is a Great Idea”. The ASEAN Charter currently rules out Australia as a potential member state as Australia is recognisably not located “in the recognised geographical region of Southeast Asia”. See Dobell, “Australia as an ASEAN Community Partner”. Bob Carr, Diary of a Foreign Minister (Sydney: NewSouth Publishing, 2014), 275; see also Dan Flitton, “What DFAT Really Thinks of Australia Joining ASEAN”, The Interpreter, 16 March 2018, https://www.lowyinstitute.org/the-interpreter/what-dfat-really-thinks-australia-joining-asean. Dobell, “Australia as an ASEAN Community Partner”, 26. John Blaxland, “ASEAN Matters and Deserves Credit”, The Interpreter, 6 February 2018, https://www.lowyinstitute.org/the-interpreter/asean-matters-and-deserves-credit. Department of the Prime Minister and Cabinet, “ASEAN–Australia Relations”, https://aseanaustralia.pmc.gov.au/asean-australia/relations; Malcolm Turnbull, “ASEAN Summit Reflects our Standing in the Region”, The Sydney Morning Herald, 14 March 2018, https://www.smh.com.au/politics/federal/asean-summit-reflects-our-standing-in-the-region-20180313-p4z44g.html. Penny Wong, “Australia and ASEAN: The Next 50 Years”, The Interpreter, 8 August 2017, https://www.lowyinstitute.org/the-interpreter/australia-and-asean-next-50-years. In the ASEAN Charter, the ASEAN Secretary General is the Chief Administrative Officer of ASEAN and is given a rank equivalent to that of a Minister, http://www.asean.org/wp-content/uploads/2012/05/11.-October-2015-The-ASEAN-Charter-18th-Reprint-Amended-updated-on-05_-April-2016-IJP.pdf. Commonwealth of Australia, DFAT, “South-East and East Asia”, in Australian Aid Budget Summary 2018–19 (Canberra: Department of Foreign Affairs and Trade, 2018), http://dfat.gov.au/about-us/corporate/portfolio-budget-statements/Documents/2018-19-australian-aid-budget-summary-south-east-asia.pdf. Data taken from DFAT’s current country fact sheets for Southeast Asia: http://dfat.gov.au/geo/east-asia/Pages/east-asia.aspx. Tulus Tambunan and Alexander Chandra, “Maximizing the Utilization of ASEAN-led Free Trade Agreements: The Potential Roles of Micro, Small and Medium-sized Enterprises”, TKN Report, International Institute of Sustainable Development, March 2014, 11, http://www.iisd.org/pdf/2014/tkn_maximizing_asean.pdf. A 2015 study on ASEAN and ASEAN+1 free trade agreements also reports a low AANZFTA utilisation rate. Lili Yan Ing, Shujiro Urata and Yoshifumi Fukunaga, “How Do Exports and Imports Affect the Use of Trade Agreements? Firm-level Survey Evidence from Southeast Asia”, in Lili Yan Ing and Shujiro Urata eds, The Use of FTAs in ASEAN: Survey-based Analysis (Jakarta, Indonesia: Economic Research Institute for ASEAN and East Asia, August 2015), 1–24, http://www.eria.org/ERIA-RPR-FY2013-5.pdf. Although as noted by one of the reviewers of the original draft of this work, recent information provided by Australian authorities indicate that AANZFTA’s utilisation rate is improving. One of the reviewers noted that Singapore’s figures may be inflated, and those of other Southeast Asian economies deflated, by Singapore’s role as a transhipment hub. However, according to the CEIC database, in 2017, Singapore only received 0.1 per cent of exports from Cambodia, 0.1 per cent from Laos, 5.3 per cent from Myanmar and 7.6 per cent from Brunei, suggesting that for these four Southeast Asian economies, at least, the Singapore transhipment problem is minimal. Cited in James Massola and Peter Hartcher, “Indonesian President Widodo Wants a Free Trade Agreement with Australia”, The Sydney Morning Herald, 15 March 2018, https://www.smh.com.au/world/asia/indonesian-president-widodo-wants-a-free-trade-agreement-with-australia-20180315-p4z4hc.html. Lisa Murray, “Indonesia, Australia Push for Free Trade Deal by August”, Australian Financial Review, 21 March 2018, https://www.afr.com/news/world/asia/turnbull-and-jokowi-as-close-as-keating-and-suharto-20180321-h0xs89. Shotaro Tani, “Indonesia Making Preparations to Join TPP”, Nikkei Asian Review, 12 June 2018, https://asia.nikkei.com/Spotlight/The-Future-of-Asia-2018/Indonesia-making-preparations-to-join-TPP; “Philippines Revives Plan to Join Trans-Pacific Trade Bloc”, The Philippine Star, 23 September 2017, https://www.philstar.com/business/2017/09/23/1741930/philippines-revives-plan-join-trans-pacific-trade-bloc; “Somkid: Thailand Eyes Becoming CPTPP Member”, Bangkok Post, 30 March 2018, https://www.bangkokpost.com/business/news/1437386/somkid-thailand-eyes-becoming-cptpp-member. Information on RCEP was gained from off-the-record interviews with trade officials from Southeast Asia and Japan and from a public lecture given by the Philippines lead RCEP negotiator, Anna Maria Rosario D Robeniol, at ISEAS on 8 June 2018. Her speech and accompanying PowerPoint slides can be accessed at https://www.iseas.edu.sg/medias/event-highlights/item/7753-the-17th-asean-lecture-on-the-regional-comprehensive-economic-partnership-rcep-progress-outstanding-issues-and-outlook. For more, see Amitav Acharya, Constructing a Security Community in Southeast Asia: ASEAN and the Problem of Regional Order, 3rd edition (New York: Routledge, 2014). “Joint Statement of the ASEAN–Australia Special Summit: The Sydney Declaration”, clause 29. See “Poppyland: Myanmar’s Dark Trade”, Foreign Correspondent, Australian Broadcasting Corporation, 6 April 2016, http://www.abc.net.au/news/2016-04-05/poppyland:-myanmars-dark-trade/7287338. According to Australian Government data, in the first half of 2016 “heroin profiling data identified South-East Asia as the sole source region of analysed border seizures”, with Myanmar being the major producer in Southeast Asia: Illicit Drug Data Report 2015–16 (Canberra: Australian Criminal Intelligence Commission, 2017), 73–75. Department of Foreign Affairs and Trade, “ASEAN–Australia Counter-Trafficking”, Media Release, 19 March 2018, https://foreignminister.gov.au/releases/Pages/2018/jb_mr_180319.aspx. For more on DFAT’s budgetary problems, see Alex Oliver, “Australia’s Flatlining Foreign Affairs Budget”, The Interpreter, 10 May 2017, https://www.lowyinstitute.org/the-interpreter/australia-s-flatlining-foreign-affairs-budget. For information on the establishment of the ASEAN Regional Forum and Australia’s support for its establishment, see Rodolfo Severino, The ASEAN Regional Forum (Singapore: Institute of Southeast Asian Studies, 2009).